This week marks the centenary of the Royal Assent of the Representation of the People Act 1918 which gave some women the right to vote (it would be another decade before voting equality with men was to be achieved). It is worth reflecting on, and celebrating, the life of a woman who made Lewisham her home and was actively involved with the struggle – Eugenia Bouvier, usually known as Jeannie. 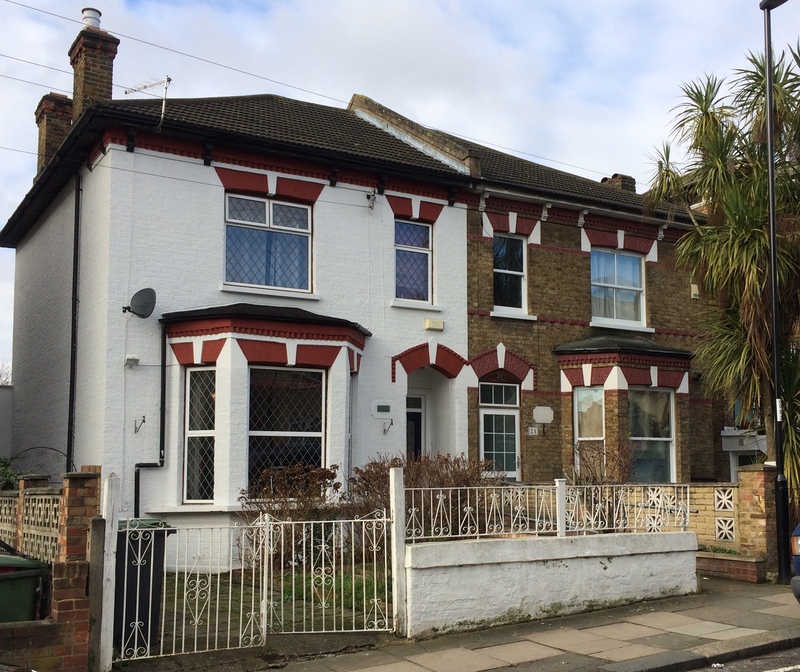 They settled in Catford, just off Stanstead Road, at 21 Ravensbourne Road – they were there when the census enumerators called in 1891 – he was a French teacher, initially at King’s College, London and then at the nearby St Dunstan’s College in Catford. They were well enough off to be able to afford a servant – a 20 year old, Alice Whiffin. They remained there for the rest of the decade as, somewhat ironically, given later events, Paul appeared on the electoral register there until 1899. They had a daughter, Irene Eugenie, in 1893 whilst living there. There is no mention of them in the 1901 census, although given the struggles that officialdom seemed to have struggled with both her names they may just be hidden in spelling errors and poor handwriting. It is known that at some point Jeannie was living at 32 Mount Pleasant Road (1). She was widowed in 1904 when Paul died, aged just 46. Her home in Mount Pleasant Road (immediately to the left of the house shown below) was badly damaged during the Blitz, along with several neighbouring properties which were largely destroyed. The site had been cleared by the time the Ordnance Survey surveyed the area in 1949 and had flats on it built soon after. Like the two other suffragettes that Running Past has covered, May Billinghurst and Emily Davison, Jeannie was actively involved in direct action and was arrested twice due in the struggle. She was known to have interrupted a meeting in Reading in January 1908 being addressed by the Chief Secretary for Ireland, Augustine Birrell, she and others shouted ‘Votes for Women’ at regular intervals. In February the same year she was arrested as part of the ‘pantechnicon incident’ when a hired lorry was used as a ‘Trojan Horse’ in an unsuccessful attempt to enter the House of Commons. There were scuffles with the police, mainly in an attempt to resist arrest, and lots of arrests including Jeannie. There were further incidents later in 1908 where Jeannie is reported as peacefully disrupting meetings and receptions attended by the Prime Minister and other Cabinet Ministers. She appeared at Bow Street Magistrates Court in front of London’s Chief Stipendiary Magistrate – Albert de Rutzen. He compared her to ‘hooligan boys in the street’; she compared her actions with men who had used similar methods protesting against the Reform Act. She demanded to be considered as a political prisoner; he regarded her as a common criminal. He was the magistrate; she was the prisoner and was fined £5 plus 2/6d damages or a sentence of a month at Holloway – she didn’t pay the fine (3). Like many suffragettes sentenced to imprisonment she went on hunger strike and was released early, after just 10 days in Holloway (4). She was secretary of the Lewisham Women’s Social and Political Union for several years – regularly chairing meetings – including at a ‘rowdy meeting at Blackheath’ Concert Halls in October 1909 when medical students broke up seating and let of stink bombs and fireworks – leading to the police being called (5) as well as meetings in New Cross in May (6) and November 1908 (7). 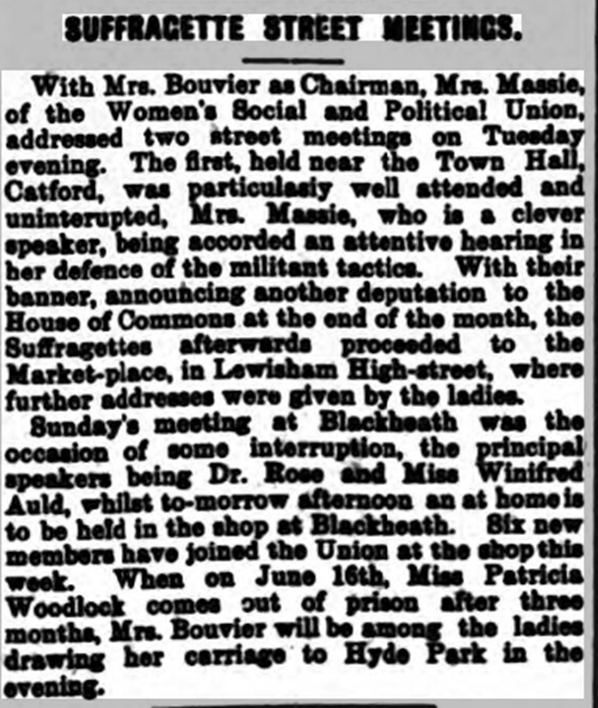 She was a regular speaker for the Women’s Social and Political Union both locally – including street meetings like this in Catford (8). She is known to have spoken at a meeting on Blackheath, presumably at Whitefield’s Mount, in September 1909 and in 1912 was present at the opening of new WSPU offices in Lewis Grove in Lewisham where a crowd of around three thousand became hostile throwing eggs (9). 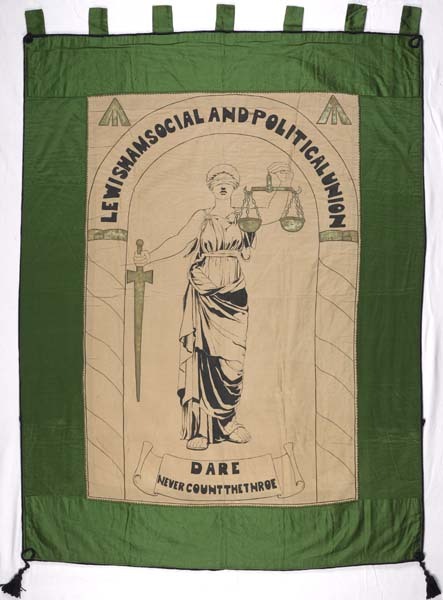 The last definitive political involvement was work in the East End with Sylvia Pankhurst speaking at conferences opposing conscription in 1915 and 1916. Pankhurst described her as a ‘brave, persistent Russian.’ In addition to be an asset to the work of Sylvia Pankhurst in her own right, she proved useful in being able to translate and interpret for the Russian emigres in the East End. She returned to post-revolutionary Russia in 1921, proud that her family wealth had been seized after the Revolution, suggesting that the wealth ‘ought to have taken.. from me years ago, and from all of us who lived on the backs of the people’. She remained there until her death in 1933 (13), working for at least some of this time at the Comintern in Moscow. WPSU Banner Photo Credit – this is part of the collection of the Museum of London, as is the photograph who allow its use for non-commercial research such as this. 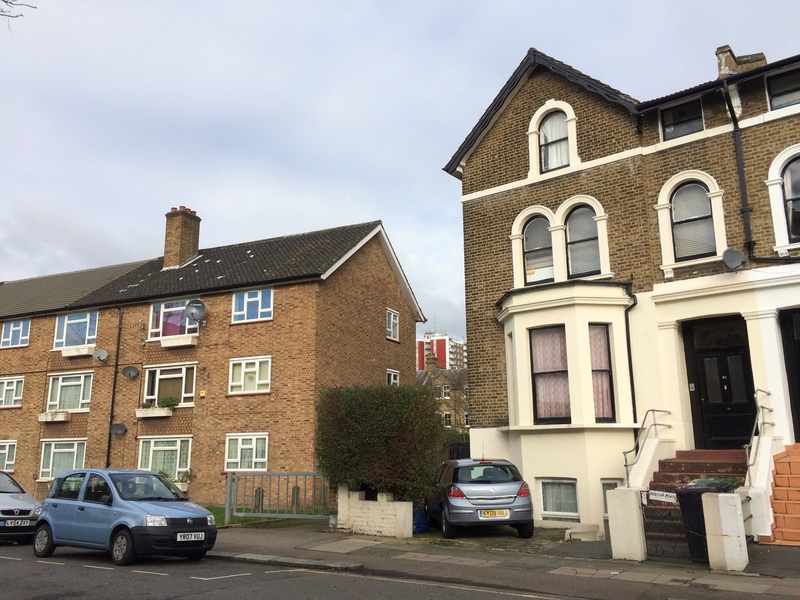 For more detail on Eugenia’s life after Lewisham an excellent starting point is ‘From Russia to East London — and back again: Eugeníe Bouvier (1865-1933), suffragette and socialist. This entry was posted in Lewisham History, Rebels & Radicals and tagged Blackheath Concert Hall, Catford, Eugenia Bouvier, Mount Pleasant Road, Ravensbourne Road, suffragettes on February 7, 2018 by Paul B.
It’s often forgotten that the 1918 Act also gave the vote to many men who did not meet the earlier property requirement, for example because they were lodgers. Thank you for this piece! I came across Mrs Bouvier on the sidelines of my research on suffragettes who became communists. Evgeniia G. Bouvier did indeed return to Russia in May 1921, where she took up a role in the headquarters of the Communist International. Thank you – that’s really appreciated; I will update the post next week with that and details of a speech of hers that I discovered yesterday. Another excellent researched historical link which has piqued my Foblc interest! Looking at cemetery records a Paul Emile Bouvier ( d 1904) is buried here, who I assume was married to Eugenie? He was indeed! Thank you for that – I will include that in an update once I have finished going through the press cuttings that Lewisham Archives have on the suffragettes. My grandmother Eliza Simmons was a housemaid at Carn Brae Ravensbourne Park in 1901, the residence of the Hart family. She was in the WSPU and in prison in 1910. This must be where she was recruited. I wonder how close Carn Brae was to the Bouviers? How interesting! Ravensbourne Park is probably 500 metres along Stanstead Road from where Jeannie initially lived in Ravensbourne Road, and a little bit further away from the house in Mount Pleasant Road. Do you know anything more about your grandmother? Do you know how long she was at the Harts? There were regular open air meetings in Catford and Lewisham at which Jeannie was a regular speaker – if Eliza was in the Lewisham branch of the WSPU they will have known each other!